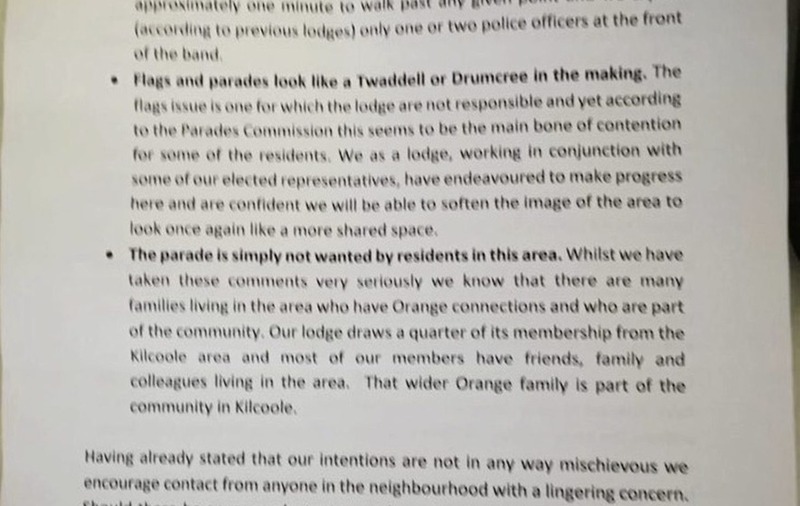 RESIDENTS of a mixed north Belfast residential area have expressed serious concerns about a planned band parade, claiming it is being orchestrated to cause division in the area. Flyers giving details of the parade to the home of the 'incoming Master' of the Cavehill Lodge were put through doors in the area late last night. 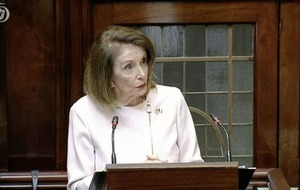 Local people say a high profile UVF man has been seen in the area in recent days. 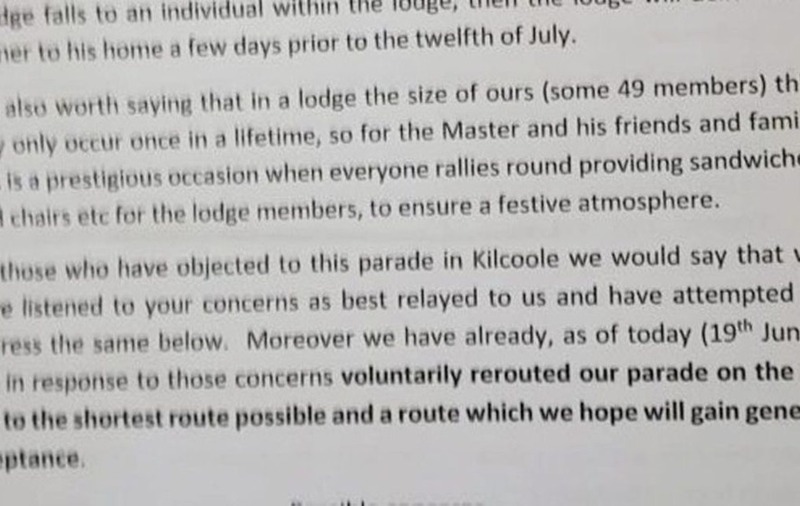 The flyer claims the local lodge will hold a 'floating of the banner' parade to deliver a banner to the head of the lodge a few days before the Twelfth demonstrations. It is signed by Ron McDowell of the Cavehill Temperance lodge. 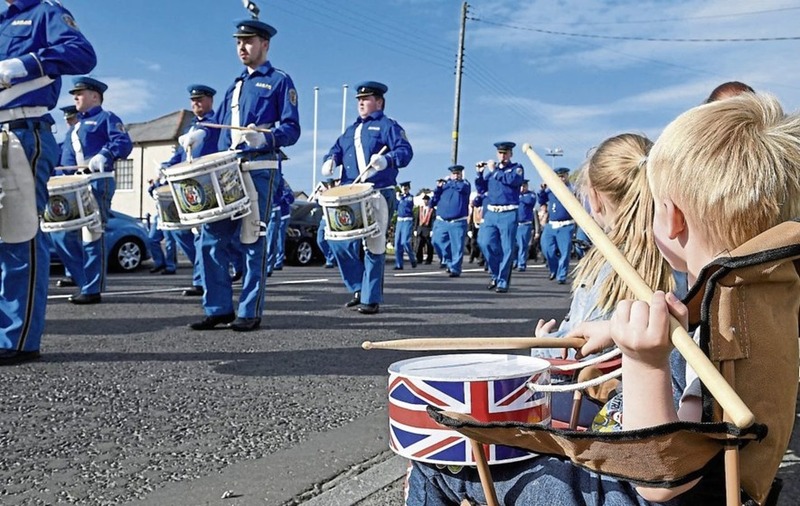 Objections have been lodged by residents who say there has never been any parade of this type in the area and they feel hard line elements, including a senior loyalist who recently moved close to Kilcoole, are deliberately trying to create a new contentious parade. 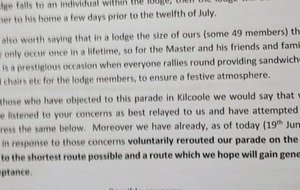 While the flyer claims the parade is a one off, it also notes there are 12 Lodge members in that area who may in the future be made master of the lodge, leading to fears that loyalists are using this as an excuse to conjure up an annual contentious march. 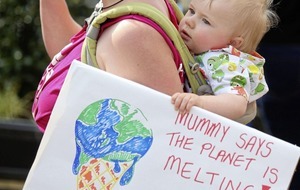 One resident told the Irish News; "This is a quiet area, people respect each other, it's a really good place to live. No one I've spoken to wants this parade to happen, the feeling is if it get the go ahead once it'll turn into an annual event and the good community we have built here will be damaged".